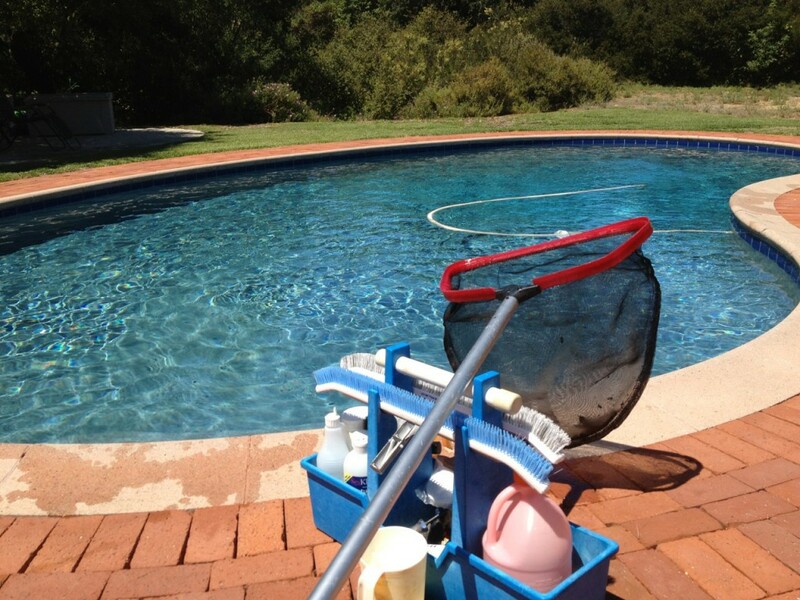 Your pool needs regular pool service and maintenance for it to remain clean and for you to enjoy. Pools can go bad pretty quickly if regular service and maintenance are not performed. Every pool is a little different so this is just a basic example of the process that needs to be done on a weekly basis. Firstly, ensure the pump is on and depending on whether you need to vacuum from the skimmer or pool vacuum suction ports make sure all the suction is directed to that particular pipe. You may have to adjust levers to do this so take note of how they are positioned incase they need to be returned afterwards. Do a chemical water analysis and adjust as needed following the instructions on the chemicals. You’ll need to know how many gallons your pool is to be able to adjust the water balance. If the pool hasn’t got an auto fill then you’ll want to top up the water level if needed by manually filling it. Set up your vacuum at the point of suction where you’ll be vacuuming from and vacuum in straight lines across the pool so not to create dust stripes and being able to cover all of the pool by working your way around it. Once done vacuuming you can then brush the walls of the pool going from top to bottom. It’s best to vacuum first so that you don’t stir up and push any debris around on the bottom if you were to brush first. Once the walls have been brushed you can then brush the water line around the tiles. Once this has been done you can then skim the surface of the pool for any floating debris. Skimming can be done first if there’s a lot of surface debris. Empty skimmer baskets and in-line vacuum canister if present. Turn off the pump and empty pump basket and return all levers to regular position if they were adjusted during the vacuuming of the pool. If chemicals were added ensure the pump is running so to be able to circulate the chemicals into the water and ensure no chemicals are left on the plaster as this can stain it. Brush in all chemicals. Always test prime the pump before leaving any pool, never leave a pump un-prime tested if you have removed the lid or done other adjustments to it. These are the basics to be done there could be many more items that need to be performed depending on the particular pool. If you need assistance with any of these please feel free to give PoolStar a call we are always happy to help! We provide pool service in Henderson and Las Vegas areas. This entry was tagged Henderson Pool Service, las vegas pool cleaning service, pool vacuum, how to service a pool. Bookmark the permalink. ← Low water level within the spa connected to a swimming pool.